This week I am on a work trip which got a bit messed around due to the threat of a hotel strike in Oslo. The net result was that I had a few hours in transit in Copenhagen, and so I took the change to get outside, and ride around Copenhagen a little. For a long time I have wanted to try riding a Christiania two-wheeler, and also to visit Copenhagen to see the bike culture there. This post will focus on the Christiania, and I will talk more about riding in Copenhagen in another post. 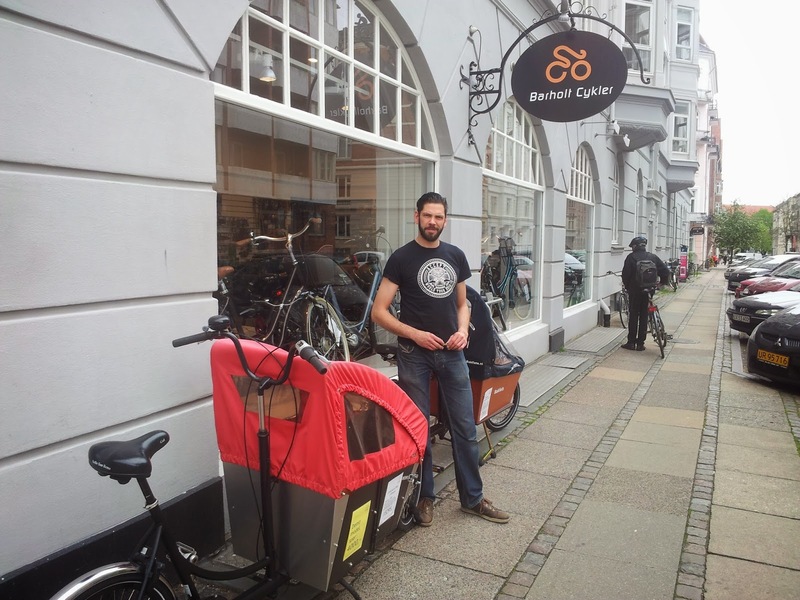 While riding around I found this nice bike shop where they were kind enough to let me take a Christiania two-wheeler for a ride, despite me being very honest that I was not going to buy it, but just wanted the chance to ride one so that I could write about my experience. He then explained that he rides a bakfiets.nl Bakfiets Long very similar to the one I ride. His view was that Bakfiets was a more "finished" bike, while the Christiania felt a bit less refined. The cover mechanism is different, but I didn't get to play with it enough to know whether I thought it was better or worse. 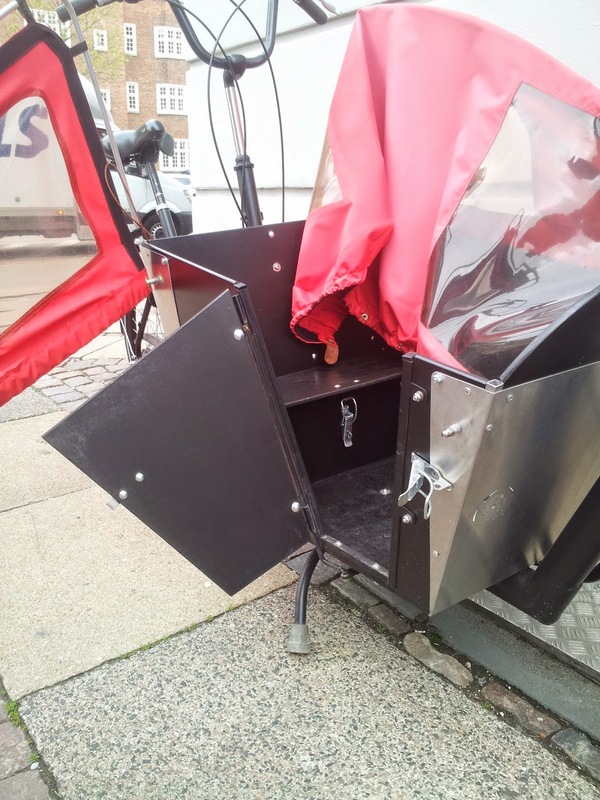 The stand mechanism on the Bakfiets was easier to operate, and a little more stable with the four feet on the ground instead of two with the Christiania, but both are fine. The two bikes are quite similar, as I have discussed in a previous post, so I was interested in how the bike felt, and how much difference the reduced weight made. Copenhagen is about as flat as inner Adelaide, that is there are some fairly gently but noticable slopes on various roads. The Christiania was quite noticeably easier to ride up the slope than I feel my Bakfiets would have been. Of course the Christiania didn't have all my junk sitting in the box and panniers, so it wasn't entirely fair, but I still expect that there would be a noticeable difference. The steering on the Christiania felt very similar to the Bakfiets, and after the first turn, I wasn't really noticing the difference, except that the Christiania has a spring that tries to return the steering to the middle, which could be felt when turning sharply, but was not a problem. The cargo box is a little smaller, both shorter and narrower, and the bike as a whole is a little smaller. As I mentioned in my other post, this would suit a smaller rider for whom the Bakfiets feels too large and heavy. All in all, the Christiania was the pleasant and practical ride that I expected.